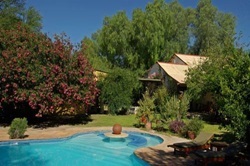 from/to Windhoek covering the most beautiful spots and lodges in the central Kalahari. 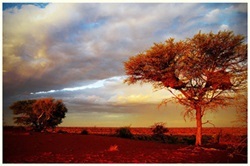 The Kalahari Experience will take you into this barren yet so beautiful part of Namibia, Botswana and South Africa. With this itinerary we will stay in Namibia though unless you decide to extend to Botswana and South Africa on various options as indicated in the itinerary. While Namibia is known for being the home of the Namib Desert, it must be remembered that much of eastern and southern Namibia is covered by another - the Kalahari Desert. 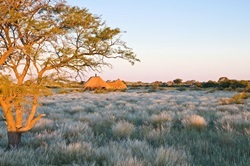 The Kalahari is not a true desert as it receives too much rain, but it is actually a fossil desert which presents you golden grass and small red dunes. The Kalahari Desert - or Kgalagadi, as it is known in Botswana – stretches across 7 countries – Botswana, Zambia, South Africa, Zimbabwe, Namibia, Angola and the Democratic Republic of Congo. In Namibia it is called a ‘desert' principally because of porous, sandy soils which cannot retain surface water, but in some areas annual rainfall can be as high as 250mm, which accounts for the luxuriant grass cover during good years. In Namibia this area is covered with trees, ephemeral rivers and fossil watercourses, and a reasonably regular rainfall pattern that occurs every year does allow for huge numbers of mammals, birds, reptiles and amphibians, plants and insects to thrive. Most of the southern segment is taken up with camelthorn, red ebony and other acacias, and towards the center silver terminalia and shrubs are common. Farther north the acacia gives way to bush savannah and dry woodland of kiaat (wild teak) Rhodesian teak, wild seringa, manketti, shiwi and other magnificent timber species. Large numbers of Tamboti trees grow in the Grootfontein area. The quiver tree (Aloe dichotoma) also occurs here. Cheetah find perfect ambush cover for Springbok, hare and porcupine, giraffes can go without water for several weeks, Zebra graze leaves, grass, bark and roots and gemsbok / Oryx obtains sufficient moisture from leaves and grasses. Black-backed jackal scavenge for carrion and otherwise survive on insects, birds and rodents. Black-footed cats, bushbaby, velvet monkey, aardwolf and honey badger, meerkat and yellow mongoose all thrive in the Kalahari Desert. The Kalahari is a superb birding destination, especially to watch raptors. Be at aw about the giant nests of sociable weaver birds. The Kalahari's true lure however lies in its eerie silence and solitude, both in the sparsely grassed plains and open spaces. Small but scattered populations of people live here. 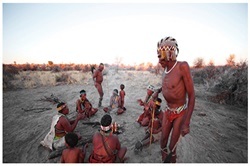 Best known of the Kalahari's inhabitants are the San Bushmen, numbering only a few thousand. The Bushmen are proud people, and keen to demonstrate their origins and knowledge of living in the bushveld. They are the remnants of Southern Africa's original inhabitants who occupied the whole sub-continent, long before black and white settlers invaded their territories. Another most interesting place to visit is Arnhem Caves, one of the largest cave systems in Africa, situated close to Windhoek. The giant leaf-nosed bat, the largest insect-eating bat in the world, can be found here as well as other sorts of cave wall clingers. Arrival at Windhoek's Hosea Kutako International Airport. 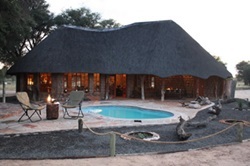 Here you take over your rental vehicle or meet your guide and proceed to your first accommodation situated in the Kalahari Desert and offering you the first contact to the Kalahari San. While at the Game Reserve you should consider day trips into the desert with a local guide tracking rhino and getting to know the Kalahari a little better. To enjoy this experience thoroughly an extension to a 3 night stay is advisable to join the 3 day Kalahari Wilderness-Excursion. The Arnhem Caves are situated near Windhoek so an extension of your tour would be wise at this point if you are interested. After breakfast, it is time to say good-bye to your hosts and continue your exploration of the Kalahari desert. Leaving the Lodge, surely with a sore heart, you are travelling south to the vicinity of the entrance gate of Kgalagadi Transfrontiers Park. Once again the advantage of free roaming game will host many an opportunity during the two game drives, one on each day, to see game and surely take stunning pictures of this extraordinary landscape. Relaxing at the lodge there will be even more motives to capture. From here it is almost a must to extend your trip for a few days into the Kgalagadi Transfrontiers Park or go for day trips from the Namibian side. Today’s departure is also a farewell to the Kgalaghadi Transfrontiers Park but not yet the Kalahari. If you want to pay a visit to the Fish River Canyon or Namibia’s first European settlement ever, Luderitz, this is the point to add more days to your itinerary. Leaving the Kalahari desert there is one more stop lying ahead of you, which might well be called the cherry on top. It is sad but unfortunately true, your tour has come to an end unless you decided to extend your stay as mentioned in numerous possibilities. If this was just to get to know the country I am sure you will return shortly to see more. Well in time for your outbound flight you return to Windhoek International airport and return your vehicle.